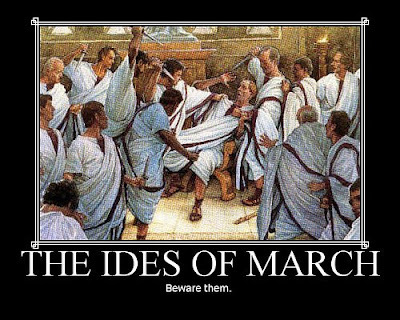 Ah, yes, the Ides of March or the 15th day of the third month. Yeah, I know it's only March 14th. But it would be too late to beware if I told you tomorrow. The phrase is best known as the fatal warning given Julius Caesar, prior to his assassination. Julius Caesar has heavily influenced our culture and society in ways you may not have known. For example, Julius Caesar is a tragedy by William Shakespeare, believed to have been written in 1599. It portrays the conspiracy against the Roman dictator of the same name, his assassination and its aftermath. It is one of several Roman plays that he wrote, based on true events from Roman history. 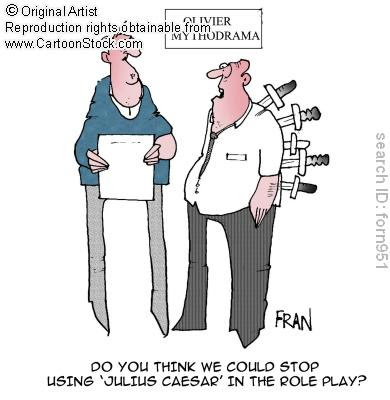 Julius Caesar is responsible for a very famous idiom. He literally “crossed the Rubicon”, which is an expression used down through the ages to exemplify when one passes the point of no return. Julius Caesar said “I came, I saw, I conquered” He might have been referring to the fact he was married 3 times. He may have heavily influenced Richard Nixon because he said: “If you must break the law, do it to seize power: in all other cases observe it." This funny stuff! But,"Ate two ...?" That's pushing it! Count: You didn't like my yoke? I came, I saw, I laughed! Brutus liked his eggs Benidictine! Keep cracking them.